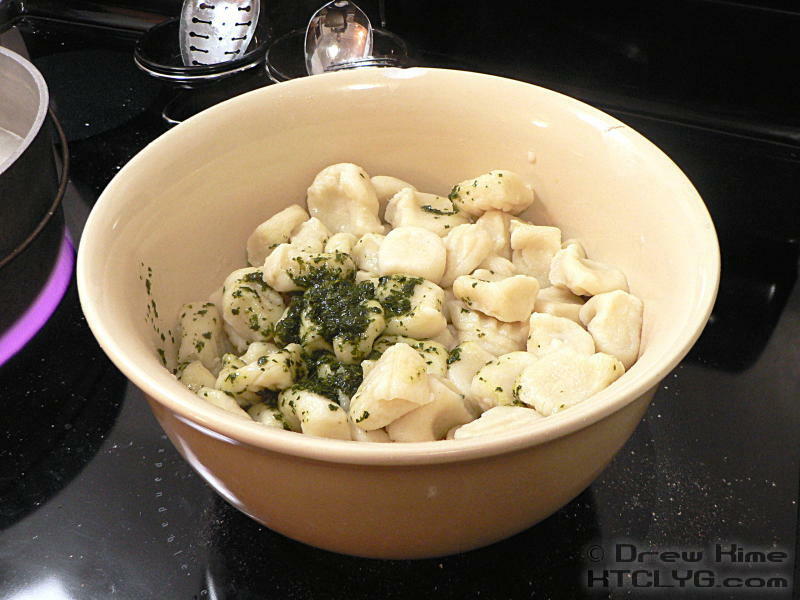 Gnocchi is a tough one. Starting with how to pronounce it: NYO-kee, like the “ny” sound from “canyon” but with a long “o” sound after. The secret, I’ve decided, is to remember that they are, after all, mostly potatoes. 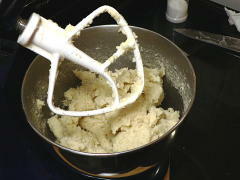 Would you eat a plate full of mashed potatoes as the main dish? Not likely. 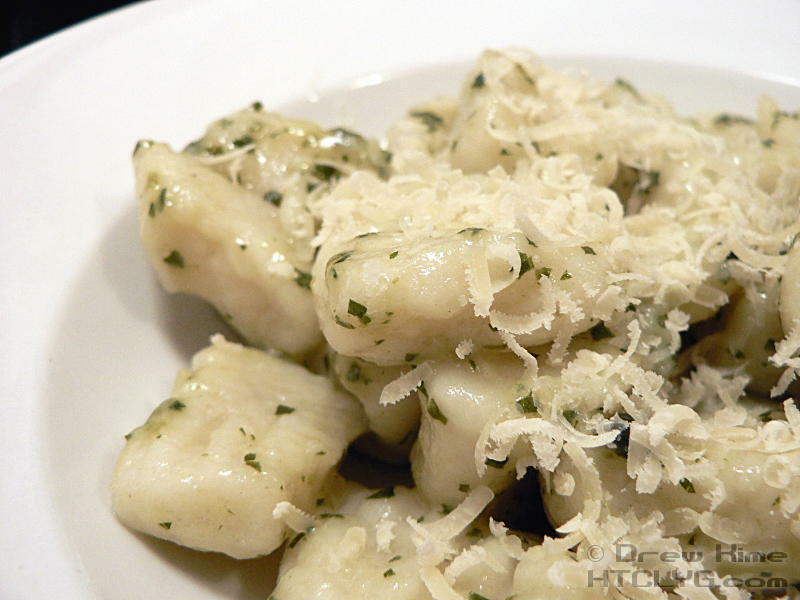 But as a side dish, with a little pesto and parmigiano-reggiano … yes, I’m talking about the gnocchi again … these are quick and easy and really delicious. Scrub the potatoes, cut into quarters, and put in a pot of boiling water. When they are soft enough that you can stick a knife all the way through the thickest piece easily, 20-30 minutes, drain them in a colander. Let them cool until you can handle them, and peel the skins off. They should come off without much effort. Press them through a potato ricer, or mash by hand until very smooth. 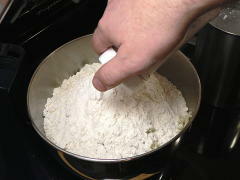 Add the flour and salt, and beat on low speed just until the flour is all incorporated. 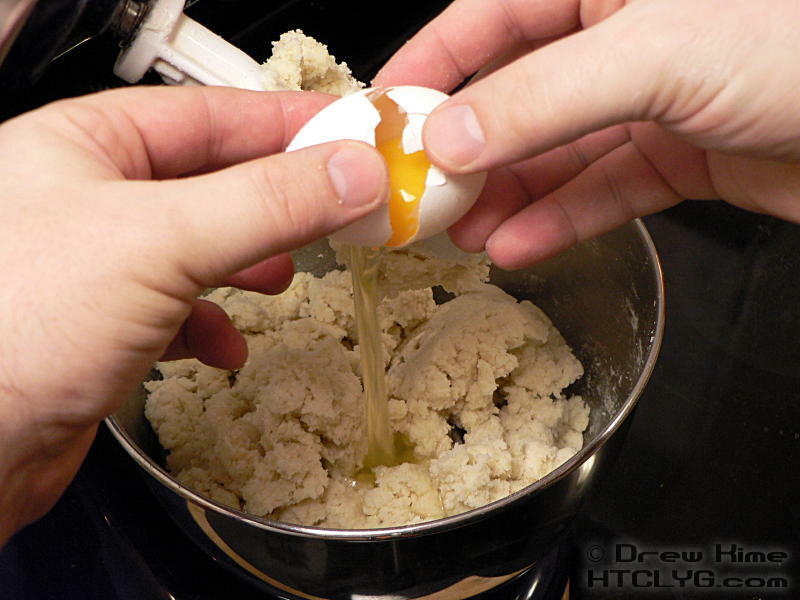 Add the egg, and beat again on low speed for 3-4 minutes. 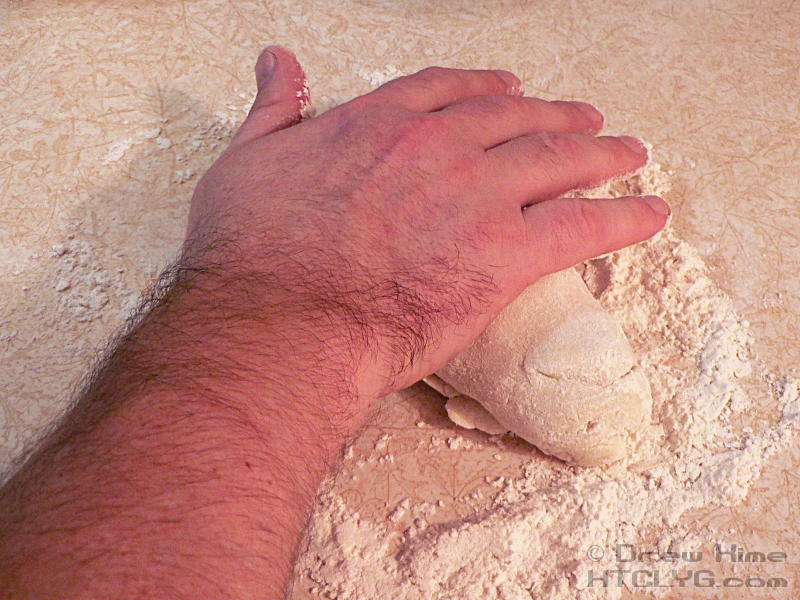 Don’t over-knead the dough. 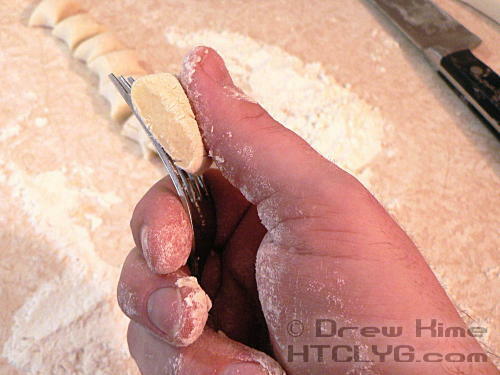 If you develop the gluten in the flour — which you normally want to do when making bread — the gnocchi will be tough and chewy. Ecch. 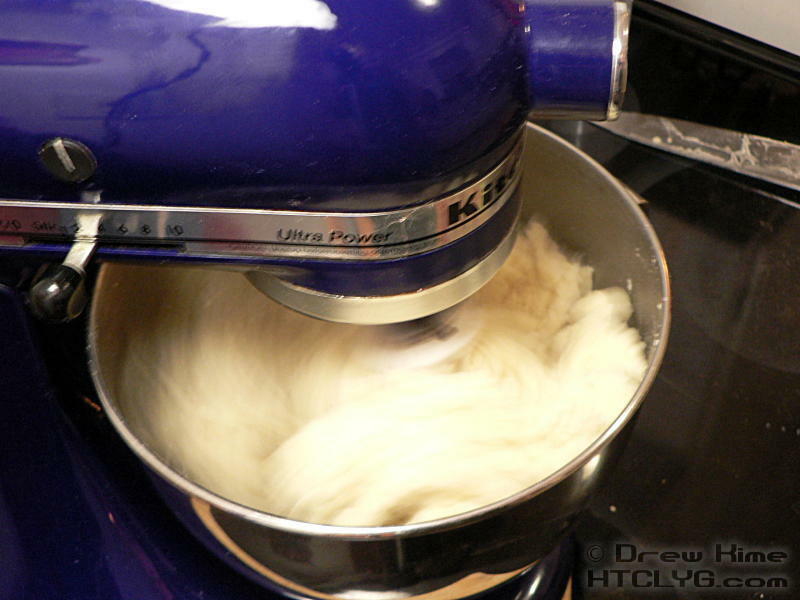 Place about a half-cup of flour on a clean surface and roll out the dough, a little at a time, into long thin rolls. It’s going to be very sticky, so put plenty of flour on your hands before handling the dough. Cut the roll into one-inch segments. 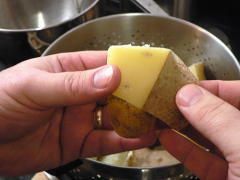 Press each segment between your thumb and a tines of a fork. 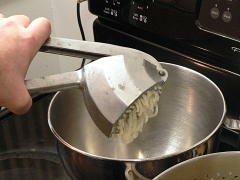 This will produce the ridges that hold onto whatever sauce you’re going to use. When you first put them in the water, they will sink to the bottom. Scoop them out with a slotted spoon when they float to the top. 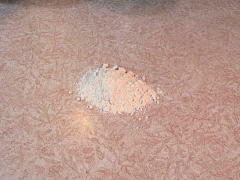 Work in batches for this part. 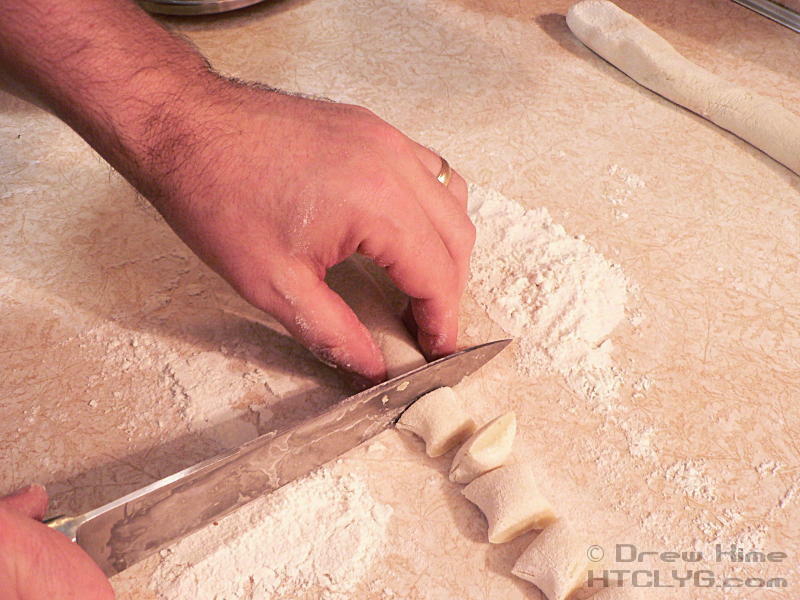 Roll one segment, cut it, press the shape in and drop them in the water. While they’re cooking, roll and cut the next segment. 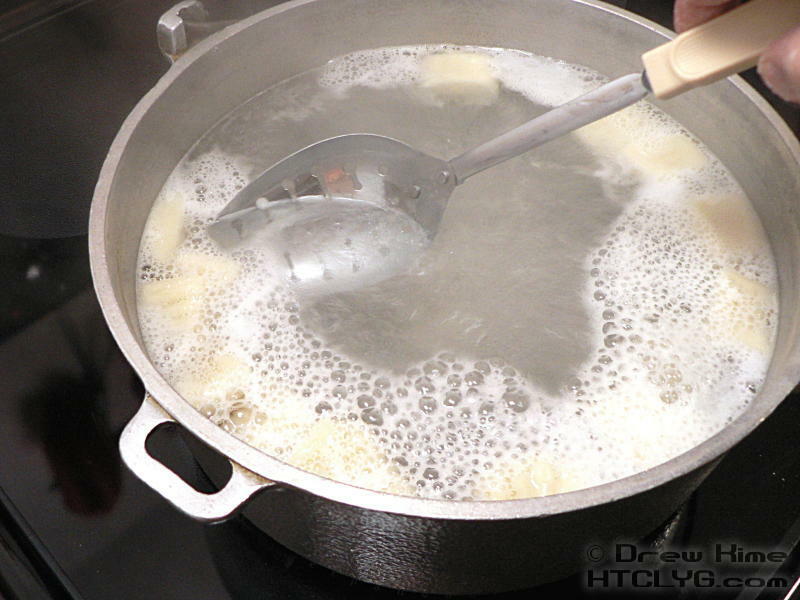 By the time you’ve done that, the first batch should be floating. Yes, it’s that quick. If you’re not going to serve everything right away, keep a bowl of ice-water handy. 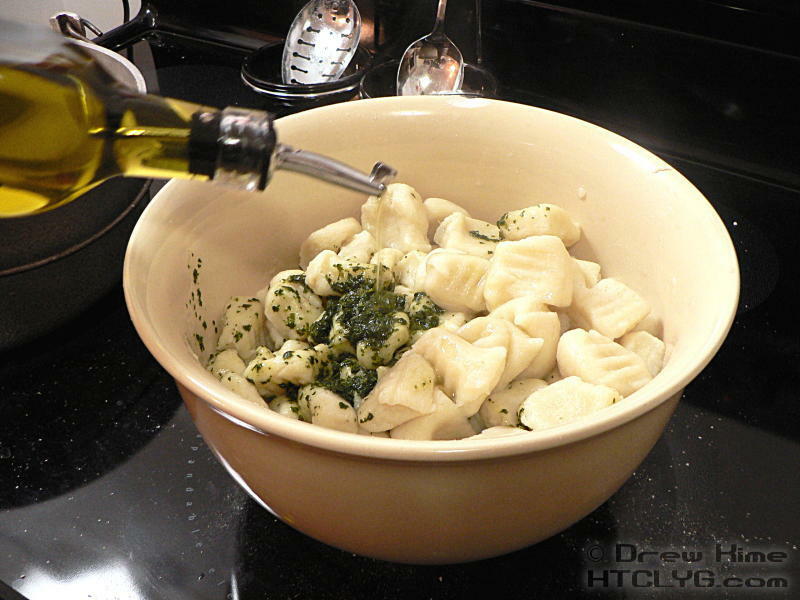 Put the finished gnocchi in that to stop the cooking process. 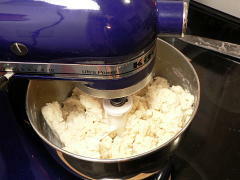 Then put them on a sheet of wax or parchment paper on a baking sheet and freeze them. 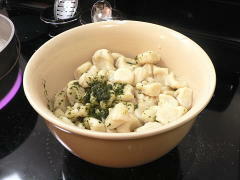 Transfer the frozen gnocchi to a zip-top freezer bag until ready to eat. 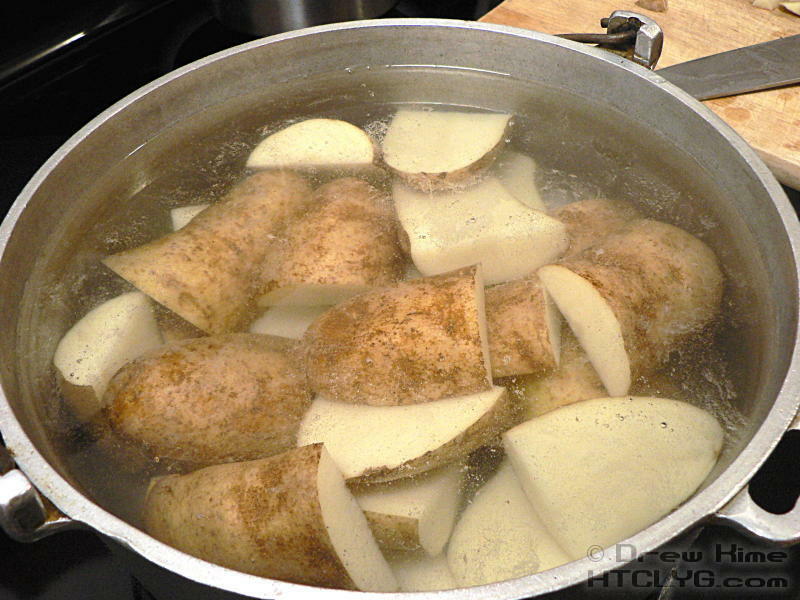 Re-heat by tossing them in boiling water until they float again. 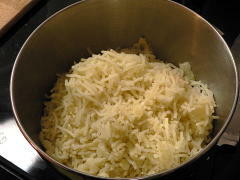 … a quick toss, and then topped with fresh grated parmiggiano-reggiano. 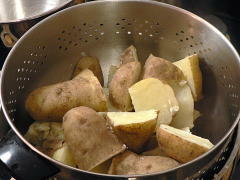 Scrub the potatoes clean and cut into quarters. 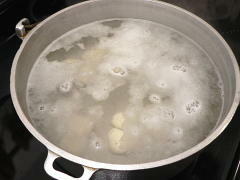 Boil for 20-30 minutes, until a knife passes without resistance through the thickest piece. Drain in a colander, allow to cool until you can handle them, and remove the peels with your fingers. They should slide right off. 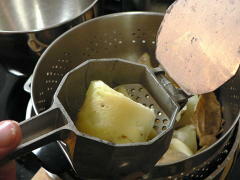 Press the potatoes through a potato ricer, or mash until very smooth. 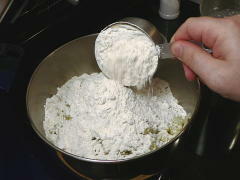 Add the flour and mix on low speed until the flour is just incorporated. Add the egg and mix again for 2-3 minutes. Roll the dough out in small batches on a well-floured surface. The dough will be very sticky. Use enough extra flour to keep it from sticking to the surface. Roll into long thin rolls, about as thick as your thumb. Slice the rolls into inch-long segments. Press each segment between your thumb and the tines of a fork before dropping in boiling water. The pieces of dough will sink to the bottom. Scoop them out with a slotted spoon when they float to the top. Serve with basil pesto. To freeze, take gnocchi from boiling water straight to ice-water to stop the cooking process. Drain and place on wax or parchment paper on a baking sheet to freeze. 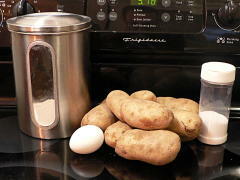 When frozen, transfer to a zip-top freezer bag. 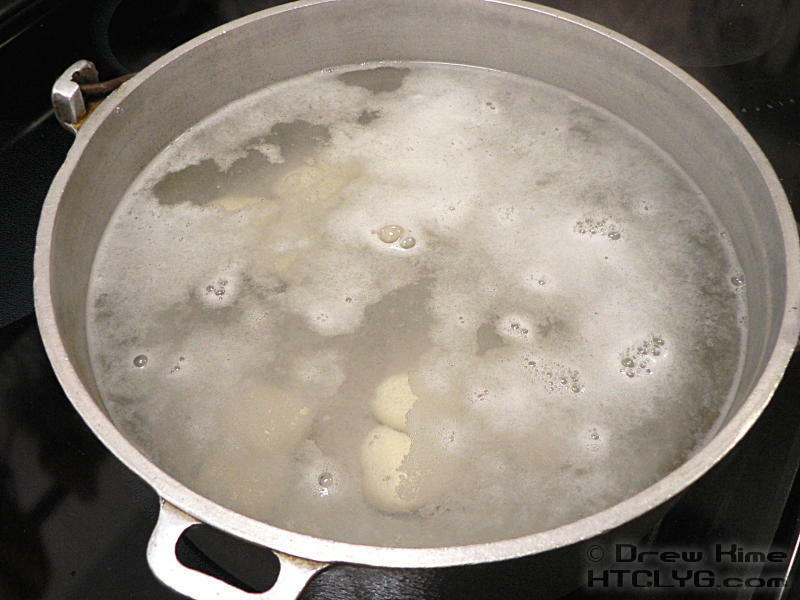 Re-heat by boiling until they float again.